Cycling is an excellent way to stay in shape, but it can also help with your mental health. For a start, it lets you enjoy the scenery in a much more relaxed way than a car would, and you can always do it in a pair. Still, to enjoy the best of scenery and try yourself on some unusual and difficult trails, sometimes you have to go there by car, and this is where bike racks come into play. Depending on what you drive and ride, there are several ways to go about shopping a bike rack. 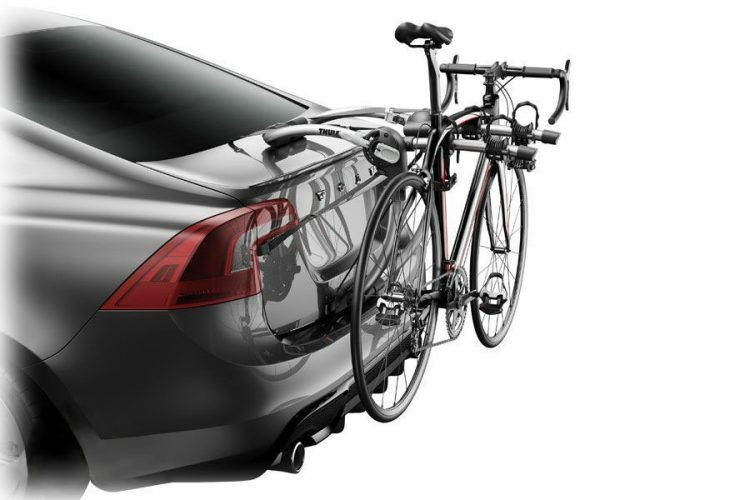 It mostly boils down to this – if you drive a nice, not-too-tall sedan, and want to keep the trunk functional, then what you need is a roof mounted bike rack. As far as your ride goes, it impinges on the way the rack clamps onto the bike. The choice basically goes like this: fork-mount vs. frame-mount vs. wheel-mount, and there’s a sampling of each below. To make life as easy as possible for you, we’ve listed and reviewed, what we believe to be, the ten best value for money roof mounted bike racks below. Each one is different in some way, so make sure you get the best option for your specific requirements. This sleek bike rack is lightweight and designed to last long. With size dimensions of 54 x 6 x 6 and weighing 9.4 pounds, the Yakima ForkLift for Mount Rooftop Bike Rack’s ergonomic build and sturdy steel construction allows it to support different types and sizes of bikes with much ease. 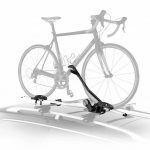 The Yakima ForkLift for Mount Rooftop Bike Rack is pretty much what it says on the tin–it’s a type of bike rack that clamps on your bike’s front fork. This is both a benefit and a drawback. The thing is, it’s all too easy to forget you have a bike on the roof of your car, and this makes gauging any clearance a risky proposition. Having a fork mount rack helps in this regard, as it somewhat lowers the height. However, this is also a problem, as it requires that you take the front wheel off every time you mount the bike. You can see how this can be a nuisance, right? Note that the bike rack’s quick release clamp is easy to adjust to take care of dropouts of different thickness. Besides, you don’t need rocket science knowledge to tighten the rear wheel strap. Once the fork dropouts are resting the bike rack’s quick release skewer, you can stead the bike using one hand while you adjust the clump to achieve a snug fit. Note you have to lift the bike above the level of your car’s roof. By design, all roof bike racks are supposed to be lifted above the vehicle’s roof. Therefore, your height, the weight of the bike you’re loading, and the height of your vehicle all factor in when considering the ergonomic difficulties of any roof bike rack. The Yakima ForkLift for Mount Rooftop Bike Rack’s clamp features three different settings. The lower two settings are perfect for accommodating the factory crossbars. On the other hand, the top setting is used for square and round bars. The bike rack also features T-bolts with hand-tightened knobs. These knobs pass through the rack and you can tighten them until snug with your hand. A bit of experimentation might be required for you to select the best clamp position for factory crossbars. Note the clamp lever is threaded the skewer slides through the bike rack. You can orient the clamp lever to the right or left. This is a benefit because you can mount the rack on either side of your vehicle. Besides, you don’t require any special tools to either install or remove the bike rack. Still, this is a great, versatile rack, as it fits almost any vehicle with flat, round or square crossbars, without any modifications. 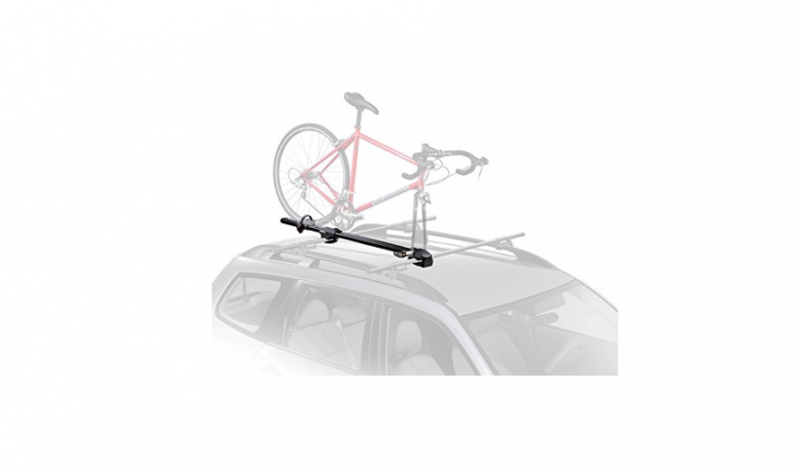 Such a convenient feature enables you to use the bike rack on various vehicles and eliminates the need to buy a tower and crossbar system especially if your vehicle has factory crossbars. Speaking of fitting, it’s worth noting that the Yakima ForkLift requires no tools for installation, just some previous experience with Legos. Seriously, though, the rack installs in minutes and locks using a skewer with an integrated adjustment knob for quick single-handed release. Sadly, the lock cores are sold separately. Any bike with 9mm quick release dropout can be securely transported on Yakima ForkLift for Mount Rooftop Bike Rack. However, the incompatibility of this Forklift with 15mm and 20mm through axle forks is a major drawback. Surprisingly, the standard 9mm quick release forks are becoming obsolete especially in the mountain bike world. On the other hand, through axles are popping up and becoming popular on the cyclocross bikes each day. Probably you think that this bike rack is out date and there is no need to buy it. But honestly, you’re wrong. You can fit it with a 15mm or 20mm Fork Adaptor from Yakima. Unfortunately, you have to purchase the adaptor separately. 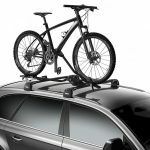 The Bike Car Roof Carrier Rack from Cycling Deal is a nice choice for folks looking to get a nice, budget-friendly rack to carry their two-wheelers everywhere. It’s a frame mount model, meaning it clamps onto your bike’s frame rather than the fork or front wheel, which is a great option, as you don’t have to take wheel off every time you mount it. On the flipside, though, this means that you’ll have a bit more trouble with clearance, as the profile will be taller. Moreover, this also puts greater stress on the frame, so it’s not quite recommendable if you ride a carbon fiber frame. Still, the rack is more than affordable and even comes with a lock that’s supposed to protect your bike from theft. It’s not a hundred percent safe, but it will deter any but the most tenacious thieves (then again, they’re more likely to steal the car rather than just the bike, so the lock does its work). Granted, the rack can’t really measure up to products that cost 4 to 5 times as much, but you do get a decent bang for the buck. If nothing else, it does a great job holding kids’ bikes, though not so great with road bikes, especially if you’re tall and have a matching bike. 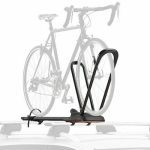 Unlike fork mount roof bike racks, the CyclingDeal Bike Car Roof Carrier Rack Bicycle Rack uses a frame holder to secure your bike’s frame. That means no scratches or dents on your bike’s frame. Using this rack doesn’t require you to remove the front wheel when loading your bike. This reduces the bike setup time, but it has a downside too; the set results in a few additional inches to your vehicle’s profile and that means height clearance difficulties. 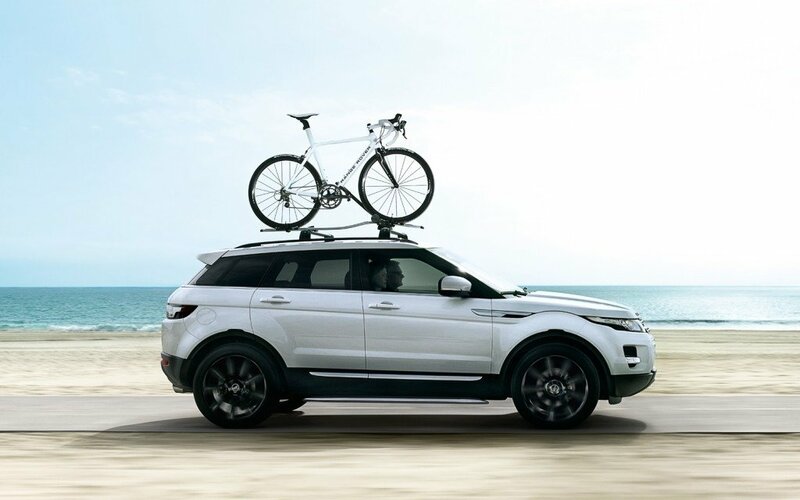 Therefore, if your vehicle already has a high profile, you may need to reconsider your options before purchasing CyclingDeal Bike Car Roof Carrier Rack Bicycle Rack. Despite the height issues, this rack is highly versatile. It can fit various crossbars in square and aero shapes. 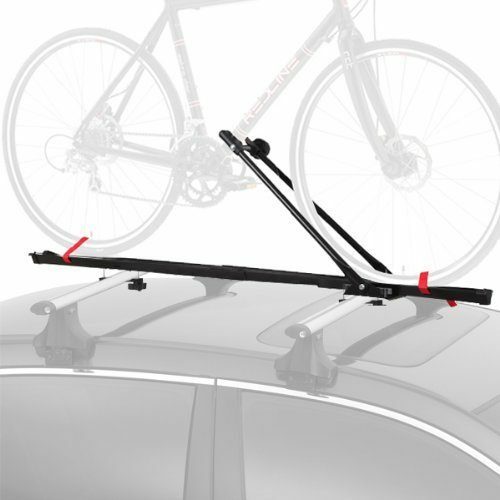 ProRack, Rola, Thule, and Rhino are some of the top crossbar brands that can fit perfectly with the CyclingDeal Bike Car Roof Carrier Rack Bicycle Rack. It’s also easy to install the bike rack. If your vehicle lacks crossbars, you may need to install them first. The rack perfectly fits with crossbars of up to 1.6 inches thickness and a maximum width of 3.2 inches. Once the crossbars are in place, the rack installation is easy. Just place the rack across, clip it onto the crossbars, and then use its easy-to-turn bolts to secure it. To mount your bike onto the rack, place the bike on the rack and angle the frame holder such that the claw can easily pop close to the bicycle’s frame. Make sure that the bike’s frame is nicely wrapped onto the frame holder claw. Use the locking knob to secure the bike onto the rack firmly. Apart from making sure that your bike doesn’t fall off during transportation, this locking mechanism makes it difficult for thieves to steal your bike especially if the rack is fixed on your vehicle’s roof. You’d expect that a company named Swagman would be more imaginative when naming a product, but then you get something like Standard Roof Rack. Still, it’s pretty much what it is, and the only thing we can do is get to know it a little better. So, living up to the name, the rack carries a single bike, irrespective of type, size, and purpose. It’s a fork mount model, so you do need to remove the front wheel before mounting the bike and securing it with a 9mm skewer that attaches to the fork. It should fit most disc brakes, though if your bike has a thru-axle, you’ll probably need an adapter. 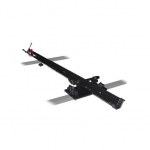 The rack attaches to a variety of crossbars, be it square, round or oval, and should tackle anything up to 3 inches. Speaking of attaching, the rack comes with quick-release and tie-down straps for the wheels, so there’s no need to buy the straps separately. You may notice that the rack costs only a fraction of a similar high-end product (about a quarter to half the price). Despite what it might imply, the rack is quite stable, and more than able to hold onto a road bike. In short, it’s probably one of the best bangs for the buck you’ll ever find. Mounting a bike on the Swagman rack is an easy task. In most cases, you need to assemble the wheel tray using the two bolts or nuts or washers provided. Also, you will have to assemble the plastic end protectors and the brackets that offer the bike support. Keep in mind that this process is essential if the rack is new. Next, ensure that the bike support arm is attached to your front roof crossbar. Use the u-shaped bolts and use the bracket and a u-shaped bolt to attach the rear bar to the wheel tray. Note that Swagman roof rack requires you to remove the front wheel to mount the bike onto the rack effectively. Once you remove the wheel, insert the fork blade into the bike support. Hold the QR lever in position and then tighten the nut on the opposite side of the QR lever using your hand. Make sure that the bike is perfectly secured. Lastly, secure the wheel tray using the provided straps. As much as we expect a company like Swagman to offer an easy to use a bike rack, you have to remove the front wheel every time you load the bike unto the rack. Similarly, you should fix the front wheel every time you unload the bike from the rack. Apart from being a tedious and time-consuming task, you can easily forget to throw the wheel in your car’s boot, and that means purchasing a new wheel! It is an inconvenience too because no one wants to waste time fixing the front wheel especially if you don’t know how to do it! In worst cases, you might forget the wheel somewhere, forcing you to purchase a new one. Thule is one of the major players in the bike industry, especially when it comes to bike racks. Their Sidearm Universal Bike Mount is definitely up to the game in justifying this reputation. Granted, it does cost a pretty penny, but rest assured you (or, rather, your bike) will feel where each and every penny went. If you’re not afraid to splash out some (comparatively) serious money, the Thule Sidearm Universal Bike Mount is definitely the way to go. First and foremost, this is a wheel mount model, which means it grabs hold of the bike by securing the front wheel using what Thule named SecureHook (their spelling). The hook does not come in contact with the frame at all, only the wheel. The back wheel, as usual, is secured with a ratcheting wheel strap for a tight and secure hold. The strap has a rubber rim adapter for additional security. The whole structure is based on a double-wall aluminum tray which provides more than enough strength and rigidity without being heavy. Of course, the tray is resistant to corrosion and should last you a good long while. For added security, as well as an anti-theft measure, the rack locks with a One-key lock cylinder (sells separately), which locks the bike to the carrier and the carrier to the rack. It should be good for most 20 to 29-inch wheel bikes, with tires going up to 2.6 inches in width. To get your car roof system ready for bike mounting, it’s important first to install the bike rack. Note that Thule’s Sidearm comes with two sets of bolts (small size and medium size). Use these bolts to attach the rack to the roof rack system (the crossbars). Note that the rack fits any proprietary rack systems, as well as any round or factory-mounted crossbars. 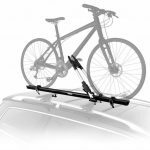 This is a great benefit because you don’t have to install new crossbars just because you purchased new bike rack that isn’t compatible with your current roof rack system. Installing the rack on the roof requires you to place it across the crossbars. Then, line up the metal brackets with the hind and front bars. Now you can secure the brackets onto the crossbars using the provided wingnuts, and remember to tighten them to a firm joint. The best part of using the Thule’s Sidearm is that you don’t require any tool to fix the rack on your car’s crossbars. To load the bike onto the rack, lift the bike and rest it on the wheel tray with front wheel resting on the wheel brace. This is what will keep your bike stable. Once you have set the bike in place, hook the SecureHold arm onto your bike’s front wheel. Note that this arm can ratchet up and down by the press of a button. Use it to make sure that the front wheel is firmly secured. Lastly, use the tie-down straps to secure the rear wheel, and you’re good to go. The Yakima FrontLoader Rooftop Bike Rack may not be the best roof mounted bike rack, but it comes pretty damn close! Granted, it’s got a price to match, but you do get the ultimate quality. Besides, if you shell out more than 2k for a superior bike, you’d want something that’s going to keep it secure. It’s a wheel mount model, meaning it can accommodate disc brakes, thru axles, and full suspension. While we’re on the subject, the rack can fit any bike with 20 to 29-inch wheels, whether it’s road, mountain or hybrid. It comes fully assembled right out of the box, and will sit comfortably on any Yakima racking system, round, square, factory, and aerodynamic crossbars. It won’t have any contact with the bike frame, just the wheel. Besides the versatility and quality of its components, the Yakima FrontLoader has one other major selling point – its lifetime warranty. With this kind of backing from the manufacturer, you can pretty much rest assured you’re getting the best quality there is. Just like most bike racks, the Yakima FrontLoader’s installation process doesn’t require any tool. All you need to do is to bolt the rack onto the crossbars. Its universal clamping system allows it to install on almost any type of roof rack system. Note that FrontLoader seems to get a perfect fit with the popular Yakima’s proprietary round bars. Fortunately, the rack is compatible with all the other types of crossbars. This amazing bike rack has a 56-inch black-coated removable wheel tray that secures your bike’s rear wheel. Note that wheel is cut at the center to minimize any chance of dirt from the bike tires accumulating at the base. The rack’s front end has a cradle with an adjustable brace to hold the front wheel in place. Note that this brace can slide up and down the cradle by releasing the levers on either side. While sling the brace up and down, try to match the wheel size and once you do so, tighten the levers to ensure that the wheel is firmly secured in place. Note that this cradle can accommodate wheel sizes ranging from size 21 to size 29 inches. There is also a shorter brace that offers extra support for the front wheel. The rack has a ratcheting strap that helps in securing the rear wheel. It’s important to mention that the tray can accommodate a tire width of up to 2.5 inches. Anything else above that limit will be a stretch. If not in use, the wheel tray can be removed to prevent theft and the noise produced when the tray moves back and forth. Among the things, you will find easy is the FrontLoader’s installation process. You simply need to open the clamp and fit it snug around the front section of the car’s roof rack system. To secure the rack on the crossbar, turn the spin handle at the front clockwise until you achieve a tight grip. Repeat this on the rear clamp and your rack will be ready for use. Once you have tightly secured the bike rack on the crossbars, you can lift your bike and fit its front wheel into the front cradle of the rack. Use the big red knob at the bottom of the clamping system to tighten the entire clamping setup. Then, use the tie-down strap to secure the rear wheel to the rack. That’s all; you are all set for a ride. To enhance the bike’s and rack’s security, FrontLoader is compatible with twin locking system. One of these locks is found on a locking cable to secure your bike onto the rack while the second lock is on the front clamp to lock the rack onto the car’s roof rack system (crossbars). The downside of this locking mechanism is that you should purchase the SKS (same key system) cores separately. 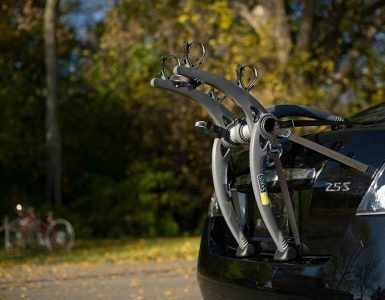 Unchanged for many years, Thule’s 598 Criterium has stood tall in the bike carrier markets. It’s a simple and dependable bike transportation solution for any cyclist in need of precise bike placement and stability without overspending. 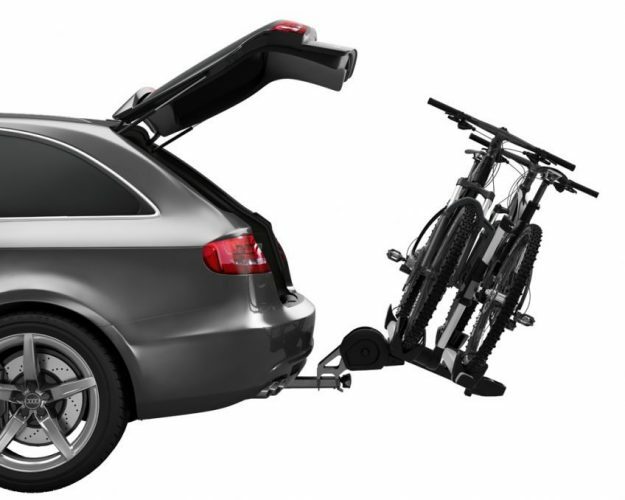 Being only one-bike carrier, it might not be helpful for you if you want to transport two or more bikes in a single trip. Thule 598 Criterium Upright Rooftop Bicycle Carrier uses a semi-permanent center support with an adjustable C-clamp on one of its ends, an aluminum wheel tray, and wheel straps (adjustable) to provide the required stability during transportation. This carrier is made to offer a precise hold on the bike being transported. In so doing, the stunning features associated with rack ensure that you don’t have to worry about a swaying bike during transportation or losing it. The Thule 598 Criterium Upright Rooftop Bicycle Carrier comes nearly assembled. 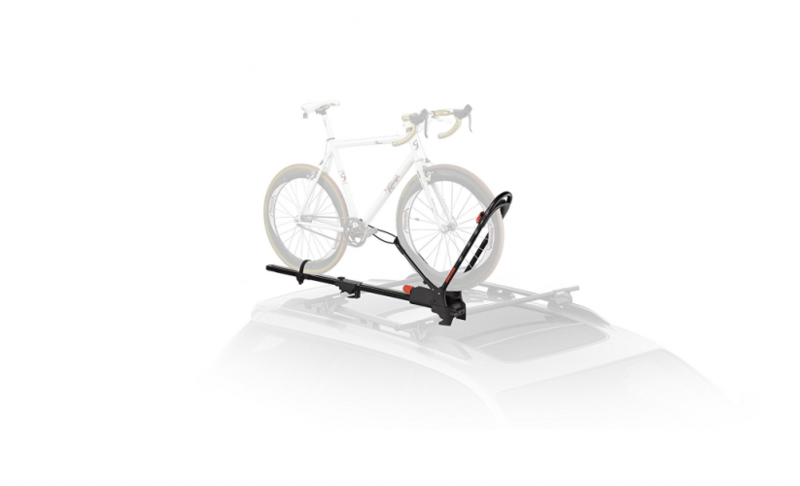 One major benefit using this carrier is that it’s compatible with all Thule rack systems and other round bars and most disc brakes. Besides, the carrier is compatible with Thule Aero profile. Unfortunately, you need an extra adaptor which you must purchase separately. 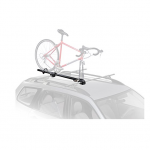 To enhance the security of your bike during transportation, Thule 598 Criterium Upright Rooftop Bicycle Carrier is compatible with the one-key lock mechanism. It locks your bike to the carrier and the carrier to the bike rack. Thus, it’s difficult for anyone to unload the bike without your knowledge during transportation. However, this lock is sold separately, and that means you have to spend a few extra bucks to enhance the security of your bike. Among the things that make this carrier popular is the level of stability it offers. The combination of Criterium’s advanced ‘frame-hold’ support element with a patented C-clamp at its end and sturdy wheel tray and the two clenchable wheel straps offer the required bike stability. This C-clamp sits at the end of a sturdy adjustable arm support from an inline position along the edge of the aluminum wheel tray. This arm support is secured using hex wrench. Note that you can adjust this arm support to an angle that the C-clamp can access the bike’s frame. Speaking of using clamping technology on your bike’s frame, you don’t have to worry about any possible dents and scratches. The C-clamp uses an integrated dial that grips and holds your bike’s frame gently to achieve the required stability. You can use the available knob at the base of the arm support to tighten the clamp’s hold gently. Surprisingly, this clamp can release the bike’s frame with a click of a button – seems like bike carriers might become automated soon. Since Criterium is an upright bike carrier, it’s likely to increase your vehicle’s height profile significantly. Therefore, you are like to face not only height clearance challenges but also difficulties with low overhangs. Besides, if you’re short, you may need to use a stool or ladder whenever you want to load your bike. 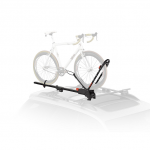 With a broad range of bike carrier styles and price points available today, it can be overwhelming to decide the right bike carrier to suit your bike transportation needs. However, one thing is certain; you need a rack that is easy to mount, a durable, and flawless bike rack. 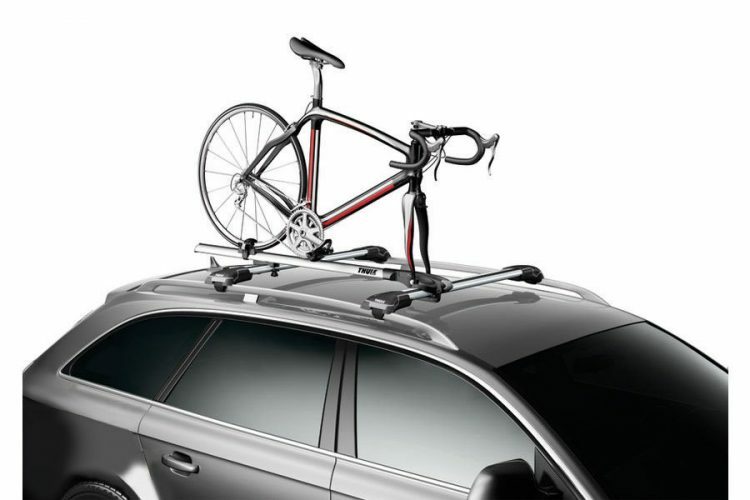 Thule offers you a range of upright rooftop bike racks with different loading and offloading options. With everything from frame or wheel mounted roof racks to fork-mounted racks, you can choose a rack that suits your needs. Thule 599XTR Big Mouth Upright Rooftop Bicycle Carrier is one of the popular bike carriers, not because of its funny name “Big Mouth,” but because of the bike stability, it offers. The Big Mouth bike carrier is designed to offer the required bike stability during transportation. 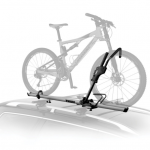 It’s compatible with all Thule racks and most round bars. Besides, the Big Mouth bike carrier can fit the Thule Aero profile, but you will need to buy an adapter separately. You can use it for arranging of bikes with disc brakes. Of all names, ‘Big Mouth’ might not be associated with strength and durability. 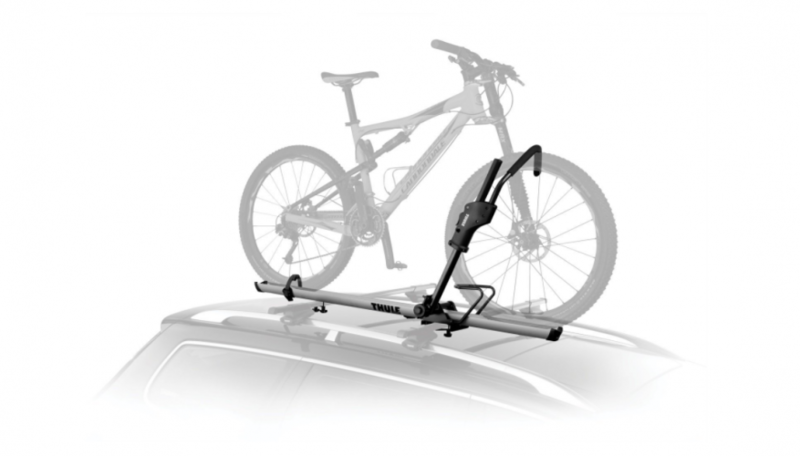 However, that’s not the case with Thule 599XTR Big Mouth Upright Rooftop Bicycle Carrier. The combination its durable aluminum wheel tray that keeps your bike’s wheels in place and wheel straps that perfectly secure the wheels to the wheel tray play a significant role in making sure that your bike is stable. Besides, jaw-like grip on the bike’s frame takes the stability offered by this bike carrier a notch higher. You even don’t need special skills to adjust the Big Mouth Carrier’s jaws or to stabilize the center support. They are controlled by a simple combination of a release handle. Note that once you apply pressure on the frame tube, the jaws automatically adjust to the right pressure for optimal holding strength. The downside of this working mechanism is that once release handle malfunctions; the carrier might become useless unless you get it repaired. Note that the carrier fits a maximum of 3 3/8 inches in diameter for tires, it can accommodate a maximum of 2.6 inches. If your bike is larger than the specified dimensions, you may need to rethink your options before you purchase the carrier. Unlike most upright rooftop bike carriers, the Big Mouth bike carrier offers you an option to enhance the security of your bike on transit. The carrier is compatible with one-key lock cylinder. This locking mechanism is perfect for securing your bike onto the carrier and the carrier onto the bike rack. However, you will have to purchase the lock separately. Though the Big Mouth bike carrier is compatible with most bikes with disc brakes, it can’t be used for tandem bikes. No adaptor can help you. Therefore, the carrier might not be an option when it comes to transportation of tandem bikes. You can consider buying Rockymounts’ TomaHawk bike rack if you have different bikes and you’re in need of a sturdy bike rack that can haul them all. It’s a roof-mounted upright carrier that allow cyclists to keep both wheels on their bikes. It can mount to nearly all types of crossbars including round, aero, square, factory, and other types of crossbars. What makes RockyMounts TomaHawk Upright Mount bike carrier unique is that it can work perfectly with all bike styles including mountain, bike, children’s bikes, cruisers, and even fat bikes with a maximum of 5 inches rubber. Most roof-mounted bike carriers are the fork mount type meaning that you always have to remove the front wheel to load the bike onto the rack. Though this might not be a big deal to most cyclists, it creates the hassle of having to stash your bike’s front wheel in your car or even worse, forgetting it somewhere. One good thing about this bike is that it’s made of a lightweight corrosion-resistant aluminum. Additionally, this aluminum is coated with black powder finish, and thus, the rack’s frame will last for many years. Besides, the rack is streamlined with a low height profile which is likely to reduce the noise by wind and also minimize height clearance issues. An additional nitpick to note is that the bike rack sometimes rattles especially when not in use. Though the sound might not be noticeable when your house windows are closed, it’s not a big concern when you position it on the car roof bars away from the driver’s seat. Note that if you’re short, the chances are that you will be unable to mount the rack and the bike on your car roof. A better solution around this challenge is to carry a small stool or a ladder. Otherwise, you may need help from someone who is tall enough to reach your car’s roof. If you love bikes, then, you definitely require an effective bike rack. While most people rely on roof mounted bike racks for their stability and not for increasing the overall footprint of the vehicle, it’s now difficult to deal with different axle standards used in the current bikes. 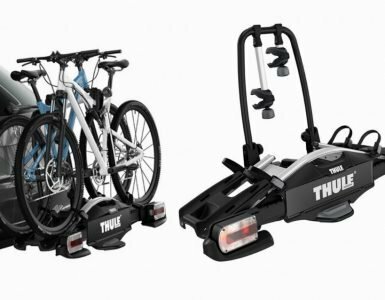 However, Thule’s ProRide Upright bike carrier offers the quickest, most convenient way of transporting your bike up to 44 lbs. The racks ergonomic design allows it to position your bike once you secure it automatically. This is because it has a unique wheel tray and a uniquely designed frame. This is an advantage to even short people because you no longer need to push the bike; all you need to do to secure the bike on the rack. If you were to secure your bike’s frame on the rack, wouldn’t you be worried about scratches and dents? Note that the Thule’s ProRide upright bike carrier has a torque limiter dial. This is an advantage because it makes bike securing an easy and quick task. The torque limiter dial regulates the amount of force exerted on your bike frame when securing it. Note that the resultant pressure is spread across a big soft claw pads that are designed to conform to your bike frame’s shape. This eliminates the possibility of frame damage. The last thing you want to worry about is a bike swinging on your car’s roof when traveling. To stabilize the wheels and ensure quiet bike transportation, the Thule ProRide Upright Bike Carrier has sturdy wheel holders. Your bike’s wheels will get fixed in smartly fixed and well-designed wheel holders. These wheel holders feature diagonal quick-release wheel straps, making it easier for you to secure the bike. The security of your bike during transit is important too. The Thule ProRide Upright Bike Carrier is designed to offer additional support to your bike, thanks to claw’s extended lower jaw. This jaw holds the bike’s frame firmly without posing any risk of frame damage. This ensures that the bike remains in place. You can also opt for one key lock system. The downside of this option is that you have to buy the lock cylinders separately. One thing that most cyclists love about this bike carrier is that it is easy to use it. The rack can be described as an easy, tool-free interface and you can easily switch the rack from one side of your vehicle to another. Fortunately, you don’t require any tool during the process of mounting or unloading the bike. 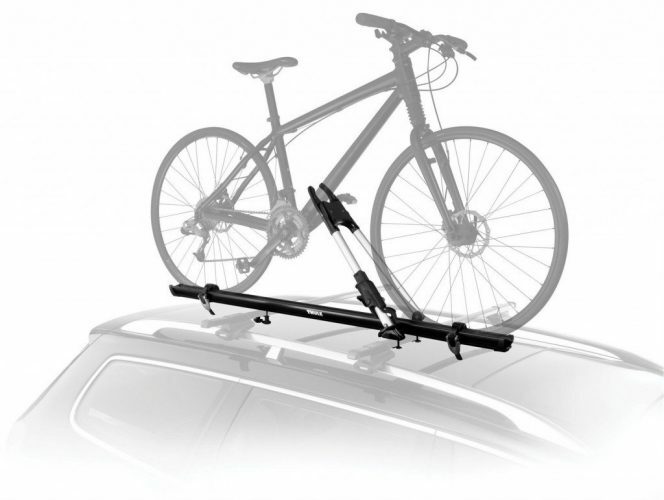 You shouldn’t forget that Thule’s ProRide bike carrier is an upright one that’s mounted on a vehicle’s rooftop. Though the rack has all the necessary features to hold the bike in place, it doesn’t take care of the height clearance issues. Since it increases the height profile of your vehicle significantly, you are likely to experience problems with low overhangs. If you have been dreaming taking an amazing bike ride all week long, you already know what to do once Friday afternoon rolls around. Perhaps it’s time to pack your bags and throw your favorite road bike on your car’s roof and get out of the town. 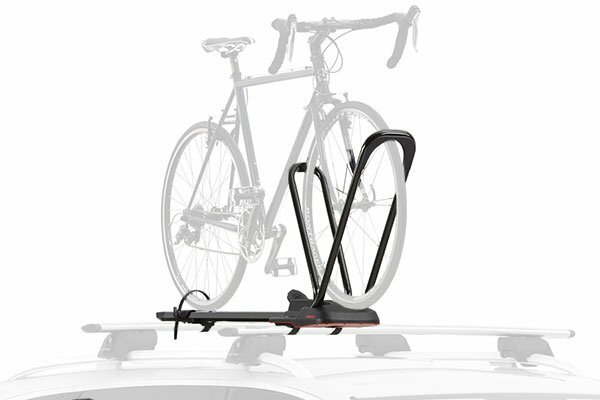 But how will ensure that your bike is safe and well-secured on top of your car without Yakima’s HighRoad Upright Bike Mount? As Yakima’s most recent addition to its upright mount family, this popular HighRoad bike rack boasts of the same user-friendliness as the rest of the brand’s mounts. A unique thing about it is that it features an adjustable hoop and cradle that can adjust to fit anything from a simple racing frame to trail bikes with less effort. Besides, the hoop and cradle can attach to various roof racks on the market currently. 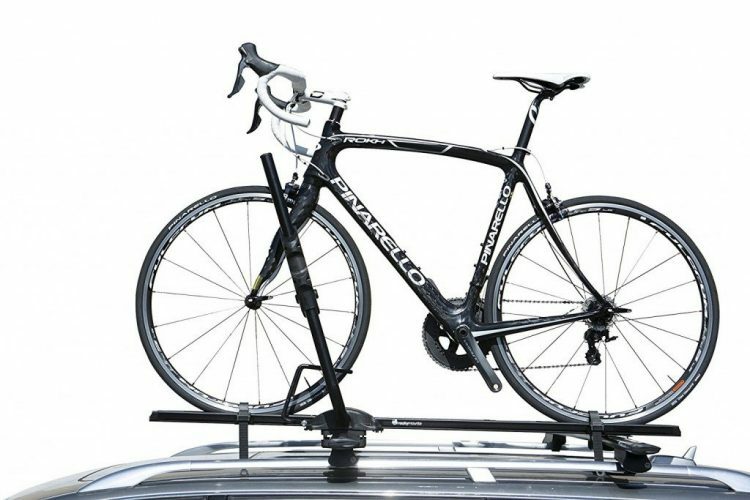 The aptly name HighRoad is a roof bike rack that positions your bike high above the road. As much as we like high things, placing your bike high above the road will definitely result in difficulties when it comes to height clearance and low overhangs as well. However, if you’re sure that the route you’re likely to use doesn’t have low overhangs, then, this HighRoad mount is a great choice. The Yakima HighRoad Bike Mount attaches to most aftermarket and factory crossbars. If you happen to be a lazy type like me, then, the HighRoad can also be a great option because you don’t have to remove the front wheel when mounting the bike on the rack. Note that the rack securely clamps the front wheel while the rear wheel is secured firmly using straps. Note that this system of securing the bike has advantageous because the clamp or the straps touch only the wheels and not the bike’s frame. Thus, the HighRoad keeps your bike dent-free and scratch-free. Transporting a fat bike will require you to swap the stock rear strap with the popular Yakima Fat Straps. Well, the bad news is that you must spend extra bucks for you to transport bikes of all sizes. But I know, it can be an uphill battle for those who aren’t willing to spend any penny after paying for the HighRoad mount. This is where this popular HighRoad mount loses a few riders. But there is a smart way to transport your fat bike using this rack. You can reduce the pressure of your bike’s front tire to squeak the rear front clamp! It sounds funny, but it’s a better way of transporting the fat bike without spending extra money. Mounting the bike or unloading is an easy task with the Yakima’s HighRoad. You don’t require any tool to unload the bike; you simply need to unclamp the front wheel and then undo the straps on your rear bike’s rear wheel. Since you don’t have to remove the front wheel when mounting the bike, you don’t have to worry about carrying tools to fix wheels. Taking your bike on the car can turn out to be a nerve-racking experience – pardon the pun and read this bike rack buying guide to choosing a product you can put faith in. There comes a time in almost every cyclist’s life when a simple outdoors strolls isn’t enough. At some point, you may want to go out, ahead further in the field and ride your bike. That means you will need to carry your bike, and if you don’t have enough space in your boot, then, you must invest in an excellent bike rack. Purchasing a bike rack is an important investment decision. Therefore, understanding different types of bike racks, what makes a good bike rack, and what you need are some of the important aspects of that investment decision. Here is a comprehensive bike rack buy guide to help you choose the right rack. The following are the main types of bike racks, their benefits, and limitations. 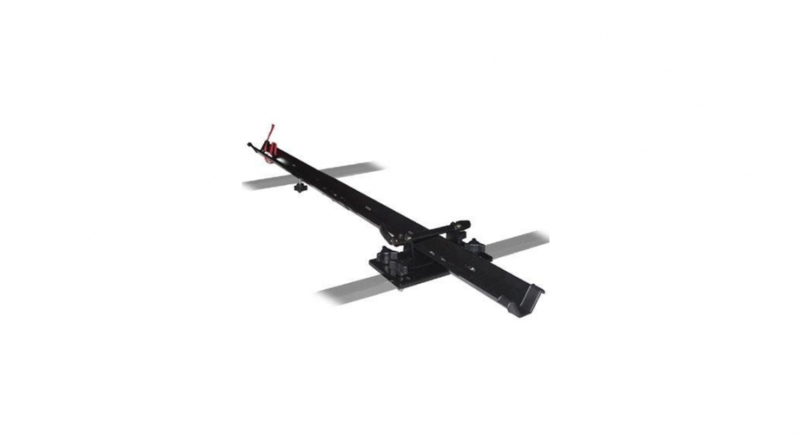 The carriers connect to a 1 and ¼ inch or 2-inch receiver hitch that should be fixed on your car. They are a great alternative if you don’t need the roof mounted racks perhaps because of height clearance issues and overhang challenges. Note that the hitch-mounted racks are normally more expensive than all other bike rack types. However, the ease of mounting and unloading a bike make these racks a popular alternative to roof racks. Besides, you don’t have to lift your bike onto the car’s roof or even remove the front wheel (for some racks). Many hitch-mounted racks have locks that secure both the rack and the bike to the car. 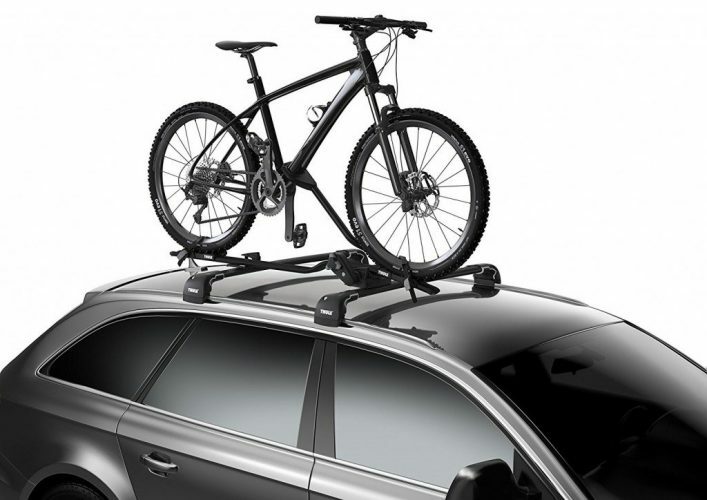 Some rack designs allow you to fit them on your car using one hand while others allow you to access your car’s boot without having to remove the bike rack. As a rule of thumb, the more lightweight a bike rack is, the more expensive it is. Besides, additional features such as inbuilt locks, repair stands, and more, increase the cost of the rack. It’s worth mentioning that your car must have a hitch (where you will fix the rack). If you lack one, then, you must spend extra bucks to get one. Some vehicles are compatible with the 1 and ¼ -inch hitches. This typically limits the number of bikes you can carry on your rack to two. A 2-inch hitch can support a bike rack that can carry up to four bikes. With your bike off, reversing your vehicle can yield some rather horrifying outcome if you forget you had fixed a rack at the back of your vehicle. If the bike rack or bike (once mounted onto the rack) covers your car’s number plate, then, you may need to purchase a number plate with light. Many roof racks have ‘feet’ that allow you to attach the rack to your car’s crossbars. If you drive a van, truck, an SUV or any other vehicle with a high roof (more than five feet high), then, you may need to think twice before you buy a roof mounted rack. Vehicles with higher height profile require you to lift your rack, fix it on the vehicle’s crossbars, and then mount your bike. While this might be not an issue to you (because you’re probably tall enough), you should keep in mind that other people (friends and family) may also need to use the rack. Even if you can manage to lift the bike, at some point, you may need a stool or a ladder especially if the center of the crossbars is out of reach. Roof-mounted bike racks are, however, a great option for vehicles with a low height profile. Besides, these racks are compatible with various crossbars. They can also be used to carry other equipment such as surfboards, skis, and cargo boxes. But if your vehicle has factory crossbars, it’s advisable to select roof-mounted racks that are compatible with such crossbars. Otherwise, you will need to replace the crossbars. If your vehicle lacks crossbars or horizontal rails, you can buy them. Most experts recommend Thule or Yakima crossbars. One good thing about roof-mounted racks is that you don’t have to take them on and off every time you want to use the rack. For convenience, you can always leave the rack on even when not in use. Once you load your rack onto the vehicle’s roof, the overall height profile will be significantly increased. This will make most parking garages, restaurant drive-throughs, and even your own garage off limits unless you remove your bike! They enhance the security of your bike (some of these racks are compatible with locks. If you forget that you have a bike on top of your van or SUV or any other vehicle and drive under a low overhang, you may end up ruining your bike, the rack, and your car’s roof. 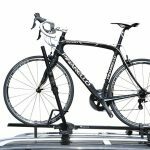 Mounting a bike on top of your vehicle increases aero-drag to your vehicle, and thus, fuel consumption is likely to increase. If your car lacks a hitch receiver (required when using a hitch-mount bike rack) and you’re not interested in using a roof-mount bike rack, hatch-mount or trunk-mount bike rack is an excellent option. These racks typical require the least number of important accessories and the installation process is easy. Most importantly, these racks offer the quickest and cheapest way of accessorizing your vehicle for bike transport. Trunk-mount bike racks are lightweight. Besides, you can use the same rack on different vehicles. However, you have to be sure that the bike rack is compatible with the type of vehicle you’re using. They contain adjustable nylon straps or cables with hooks to secure the rack to the vehicle. While you may think this is a benefit since you can adjust the straps and fix the rack on any vehicle, it’s a downside too; the rack isn’t theft-proof! These types of racks are usually attached at the back of a vehicle. Well, this is good news; you don’t have to worry about overhangs, and nothing is hindering your car doors and windows. However, you will not be able to access your trunk once the rack is in place. Many trunk-mount bikes rely on two horizontal supports made to support the bike by holding the top tube using nylon or rubber straps. This construction limits the rack’s capacity to carrying only one bike. Besides, the rack isn’t fit for bikes that lack the horizontal top tubes and can’t transport a bike weighing more than 35 lbs. The wrong bike rack can scratch your vehicle, could be a safety hazard or make it easier for anyone interested in stealing your bike to get it. Your objective is simple; you want to transport your bike, but there are a dizzying selection bicycle rack styles and different prices to choose from. This is an advantage to you, as a buyer. However, it might be too confusing and pinpointing a bike rack that will suit your needs might take some time. Here is how to pick the right bike rack. Defining your needs and assessing your current vehicle are two of the most important things you should do before you purchase any bike rack. To define your bike rack needs, consider answering the following questions. How many bikes do you intend to transport in each trip? Is there a need to switch vehicles in the future? Have you leased or rented the vehicle you’re using? How much money do you intend to spend purchasing the bike rack? Is security too important? If it is, you will need to choose a rack with security features such as lock systems. How high can you lift your bike and hold it steadily? Do you intend to transport a special bike such as tandem? 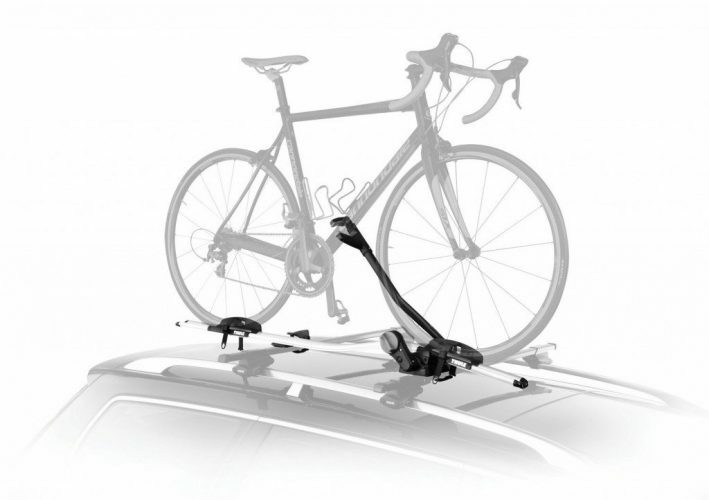 Does your vehicle has a roof-mounted bike rack? If yes, what’s the load capacity? Does it have a hitch too? Do you mount your car’s spare wheel at the backside of your car? If it has, it can hinder your vehicle from using some types of bike racks such as hitch-mount tacks or trunk-mount racks. Answering these questions will help you to narrow down your bike rack options and pick what suits your needs best. Unlike real estate where you have to figure out the best location to buy a home when choosing a bike rack, you should be more concerned about whether you want to mount your bike on your car’s roof, trunk or side. Note that roof-mount bike racks, trunk mount bike racks, and hitch-mount bike racks are the most common options when it comes to bike transportation. However, each of these has both advantages and disadvantages. Therefore, it’s advisable to carefully consider how you intend to use the rack before you purchase it. A good bike rack should be easy to install. However, some rack is confusingly constructed that even the user requires some level of engineering knowledge to either fix it on the vehicle roof or mount bike on it. It’s important that you don’t focus on solely how firm the rack will hold your bike. You also need to find out how difficult or easy it easy to install the rack on your vehicle. If you’re purchasing the rack online, then, read the reviews left by other customers. You can also read the information provided by the product manufacturer especially details regarding the installation process of the rack. Is it easy to fasten your bike onto the rack? That’s the question you should focus on. Sometimes, a frustrating rack (one that isn’t easy to load) might be the only thing that keeps you off your bike. Thus, it’s advisable to double check with the store where you’re purchasing the bike rack to find out how difficult or easy to load the bike onto the rack long before you purchase it. We all know that everything that goes on must come off. Experts advise that you shouldn’t be swayed but a rack that’s easy to mount. Don’t forget that some of the clamps, clips, bolts, and straps that hold a bike in place can be a real headache when it comes to unloading the bike. Therefore, we strongly advise that you opt for a bike rack that allows you to mount your bike easily and take it off easily. 5. How many bikes do you intend to transport? One bike? Two bikes? Three or four bikes? Though you may be intending spending a specific amount of money, it’s good to buy a bigger rack than one that you think you need. Seriously, it’s good to have an empty slot in your rack and then tell your friend to accompany you for a ride. Or perhaps you can request your son to accompany you for a ride. You will need to carry his bike too. Just like any other investment, the more you spend on your bike rack, the more you get. The size of the bike you have will dictate the size of the rack you need. Besides, you may opt to buy a bigger rack or small rack depending on different factors. For instance, do you have a large garage where you can pack your vehicle with a bike rack on top of it? Therefore, make a wise, realistic decision taking into consideration all the factors that influence the size of the rack you need. Before you buy a bike rack, there are two different security issues you should be aware of. You need to find out how firmly the bike rack can hold onto your vehicle. Is it firm enough such that you can head into the woods without worrying your bike rack is getting lost? You should inspect the rack’s mechanism to hold onto the vehicle. Find out if you’re supposed to use bolts, clamps or nylon straps to secure the rack onto the vehicle’s crossbars. The second issue you should think about is how securely does the bike attach itself to the rack. Is the rack equipped with an excellent locking mechanism? Is that something that you should purchase yourself or the rack comes with it? Have you ever seen a mangled bike by the side of a motorway? If yes, you probably understand that relying on gravity to keep your bike in place isn’t enough. The best thing you can do to keep your bike in place once you mount it on the bike rack is to secure it using the right option. Thus, we strongly recommend that you should strap the bike down in a way that doesn’t result in dents or scratches. Perhaps easy storage isn’t your first concern when purchasing a rack. In most cases, most cyclists think that the rack can simply be folded when not in use and stored anywhere. If you’re one of such cyclists, then, you’re terribly wrong. Purchase a rack that can be stored easily. Thus, the availability of storage space is an important factor to consider when purchasing a bike rack. Besides, you should be careful when loading your bike on the rack. Keep in mind that frequent falls, scratches, and dents can make your bike look older than it is. Therefore, if you can’t mount the bike alone, consider getting a friend or a colleague to help. Apart from making sure that the bike is safely mounted on the rack, you should also focus on keeping your bike in good condition. Choosing the right bike rack isn’t a walk in the park. In fact, you should take your time to do a thorough research. Get to discover the different types of bike racks on the market today. Compare different features of these racks and get one that suits your needs and preferences. Besides, you shouldn’t ignore the cost of the rack you intend to purchase is also an important factor to consider.